Full Admins must setup the configuration per country and/or state to use the automation of Post Adoption reports. Click Settings > PAR Due Dates Schedule. Click the name of the Country or State to configure. Set the following prompts for each country/state that your agency serves. Click Save. The next record that meets the Trigger criteria will have Post Adoption Report records created. Options: Final Court Date, Adoption Finalized Date, and Child Arrived Home Date. These options may be different if these fields have been renamed. Set whether these are in weeks or months. 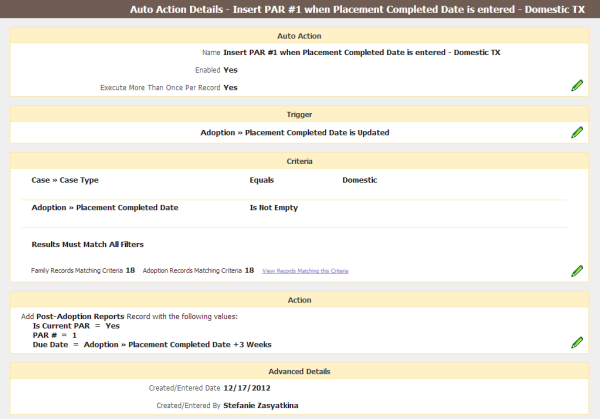 Enter when Post Placement Reports are Due to Family, Due to Agency, and Due in Country from the trigger date. It's easiest to begin with the Due in Country, then work back giving enough lead time for the Due to Agency and Due to Family dates. Due in Country is the actual due date for the report. Due to Agency should be a month or so prior, enough time to allow workers to finalize and mail the report, meeting the deadline for Due in Country. Due to Family should be set to a month or so prior the Due to Agency date, as a reminder that this report is upcoming. Set how often and when these annual reports begin from trigger date, until a specified age of child. Set how many months prior for the family and agency due dates.